The Green Company wanted to reach new heights with their Five Lanterns residences, by enhancing the homes’ energy performance and indoor air quality. 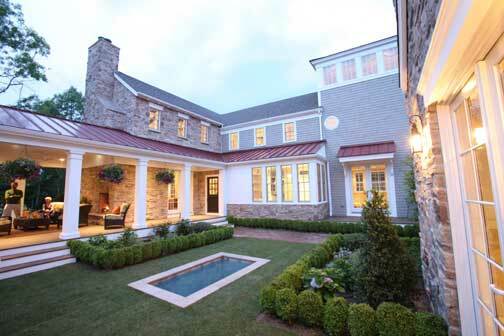 These luxury homes are located at The Pinehills, a master planned community in Plymouth, MA. The Green Company is a nationally recognized home builder – named America’s Best Builder in 1992, 2000 and again in 2007 by the National Association of Home Builders and Builder magazine. Tohn Environmental working in collaboration with ZeroEnergy Design, an architectural design and mechanical engineering firm, provided building guidance and specifications that helped the client to reduce the energy usage of the homes and create healthier living environments. To improve the indoor air quality, we identified construction practices and building materials to minimize asthma triggers, avoid moisture problems, supply clean fresh air, reduce allergens and provide low-toxicity materials. The Five Lanterns homes will be Energy Star certified and meet the highest industry standards for improved indoor environmental quality. Boston magazine has chosen Five Lanterns to be the site for Design Home 2008. “We strive to bring our homeowners the best in every community we build. Working with ZeroEnergy Design and Tohn Environmental, we know that Five Lanterns offers an exceptional lifestyle together with great energy performance and healthy indoor air quality”, said Rick Maranhas, Executive Vice President of Construction, The Green Company.